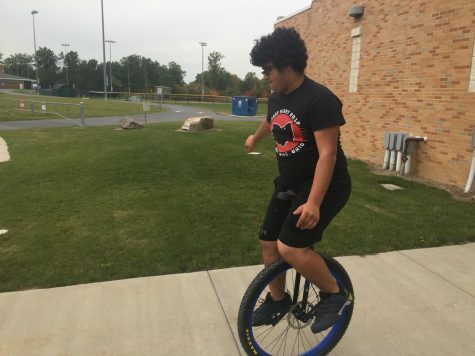 During a long boring summer, Richard Garber, a junior a Westlake High School, discovered a new passion- unicycling. 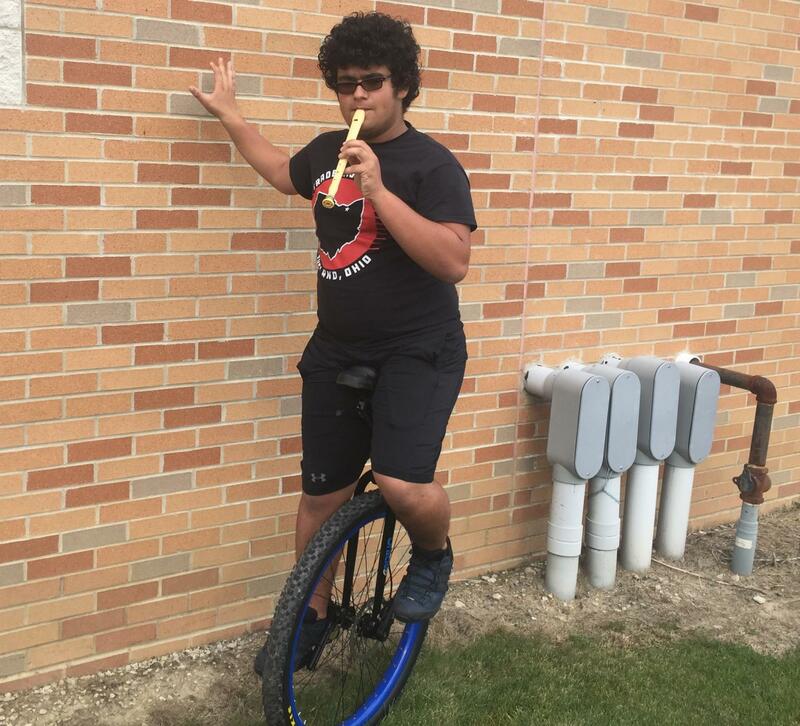 His family happened to own a unicycle and he was desperate to try something new, so he decided to pursue it. Not only was it fun, but also it also became one of his most challenging hobbies. He says it took months of practice and failure in order to achieve the dexterity to ride the unicycle subconsciously. The process of learning how to ride a unicycle was hard. Unicyclists need both the eye-hand coordination to master sharp turns and the brute strength to prevent themselves from falling. “Unicycling involves your core, glutes, and hamstrings, but it is the core that carries you forward,” says Richard Garber. He started out by only going a couple feet while using a wall for balance. 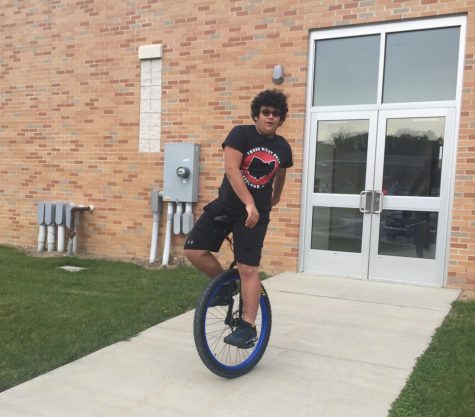 It took failure after failure until he was able to proficiently ride his unicycle with ease. At first, Richard approached unicycling as a hobby, but eventually, he used it as his primary form of transportation. Richard can’t drive a car, so he typically rides on his unicycle to school in the morning and carpools with friends on the way home. Because the size of a unicycle is practical, Richard is able to take it with him, no matter where he goes. How do people usually react when they see you riding on your unicycle? Richard: Sometimes I can get a lot of yells. People get their phones out and take pictures of me. I am fine with it. My most interesting experience is when an old lady stopped. She said I made her laugh and inspired her to exercise more. Then she gave me 40 dollars. I was very happy since I wouldn’t need money for the next month. What are some tricks you can do on your unicycle? Richard: On my small unicycle, which is more for tricks compared to my big one, I can do some small bunny hops, stop in place, go backward. I am constantly learning. The next thing on my list is idling, which is where you hover back and forth in one spot, which is a very useful skill because I would not have to get off if I am stopping at a traffic light or stop sign. What are some advantages of riding on a unicycle? Richard: For one thing, it is a much better workout. It involves your core, glutes, hamstrings, triceps. Also, bicycles typically don’t fit into cars while unicycles will fit into any car. So if you want to catch a ride home after school and ride your unicycle before school, you can do that. You are not limited by your vehicle. How dangerous are unicycles compared to bikes? Richard: Compared to a bike, unicycles are much less dangerous. I would say on a bike, which are much heavier, are much harder to get back up if you tip over. On a bike, you can’t really fall forward or fall back. On the other hand, on a unicycle, you can fall to your feet and get back on your feet. So actually, it is safer since you can fall to your feet instead of the side of your body. Since when did you learn to ride the unicycle and why did you become interested in it? Richard: So I started in the summer of 2017. My family owned a unicycle for some reason. I thought it would be cool to ride it and I did not really think of it as a form of transportation. I just like trying new things, but then I realized that it can fit in your trunk and the backseat of a car. I realized that I can ride it to school when if I can’t find someone to give me a ride. It became the perfect form of transportation. It was more fun, quicker than walking, and easier to fit in someone’s car. What was your experience riding the unicycle the first time? Richard: I think it was really positive but a very slow process. Learning to ride the unicycle is just like learning to ride on a skateboard or ripstick. I would fall off but I did not get any injuries until l started mountain unicycling and even then I don’t think I broke anything. I only bled once from minor scrapes. Richard: Well to get on, you put your foot on. For me, it is my left foot and then you jump on and you start riding. Once you are riding, your core is what keeps you perfectly balanced and you tip forward to go faster. It is really easy once you get on since you are carried by your core. How does braking work on a unicycle? Richard: Cheap unicycles don’t have a break. However, the wheel doesn’t have something called a freewheel. What that means is that you can break just by stopping and not pedaling. It is not like a bike where if you stop pedaling, you will continue to go forward. For a unicycle, if you stop unicycling, it will stop. However, on mountain unicycles, there is a brake that you can use on either tight turns or just to stop. The break on a mountain unicycle, a Shimano brake, is your standard bicycle brake. However, it is mounted slightly differently. What is it like to travel long distance on a unicycle? Does it require more concentration while riding on a unicycle? Richard: It depends on how good you are. When I first started I was constantly looking at the road. I could not listen to music because if someone talked to me, I would fall. At this point, I listen to music and take calls while riding on my unicycle. Little bumps on the road do not really stop me. Do you usually use your unicycle for transportation? Richard: I mean a lot of times I have parents, so they try to drop me off. But I at least use it once a week. Other than carpooling with other people, it is my primary form of transportation. What are some recommendations for people who are just starting to learn how to ride the unicycle? Richard: Get a cheap unicycle and then continue to practice. You will fail on the first day, but keep failing. Then on the next day, you can go around 5 feet. You will hit roadblocks and you will need to sleep on it. I think after 2 weeks, you are able to turn and after that, you will be able to just go around on your unicycle. I would recommend that when you are just starting, use a wall to support yourself to jump on.